This will be a blessing. A feature that allows you to quickly retrieve an e-mail sent to the wrong address...or sent in haste. Only the first applies to me because I can't remember ever sending an "ill-advised" e-mail to anyone. Not in my nature. Too cautious and courteous. But my laptop recently went through a strange phase of throwing up the list of like names after I typed in the first two or three letters of the addressee, but then, after I selected the correct recipient it defaulted to another on the list. So I had something I intended to send to Cam Slater go to MP Cam Calder - from memory it was only a link to something of interest. And another message intended for Rodney Hide go to Rod Vaughan at the NBR. Neither posed a problem and I was able to send a follow up e-mail telling them to disregard. But have you ever had a real clanger or OMG moment? Update; That's funny. Cam Calder isn't even in Parliament any more but I had to look it up on Wikipedia. Left late 2014. So "recently" must have been last year. How time flies. “The Youth Service has been very successful, with 86.5 per cent of clients engaged in education, training or work-based learning at the end of March 2015,” Mrs Tolley says. The Bill extends the extensive wrap around support provided by the Youth Service to at risk 18 and 19 year olds and 19 year old teen parents. “Extending the Youth Service means more of our at-risk young people will be supported into education, training or work and be less likely to remain on a benefit long term,” Mrs Tolley says. Eighteen and 19 year-olds without dependent children will be assessed when they apply for a benefit and those at risk of long term welfare dependence will receive Youth Service support. All clients referred to the Youth Service will have a youth coach, budgeting obligations and be money managed. They may also receive incentive payments when they meet certain obligations. Teen Parents referred to the Youth Service also have an obligation to attend a parenting course, enrol their children with a Primary Health Organisation, complete Well Child checks and ensure children attend Early Childhood Education. The extension of the Youth Service was part of the Government’s 2014 election manifesto. If you’re receiving Youth Payment or Young Parent Payment your provider will give you a payment card. Some of your weekly benefit payment will be loaded onto your payment card for you to use for things like food, groceries, basic clothing and household items, healthcare items, public transport passes, and things you need for your education or training. Your payment card is like an debit card, but it can only be used at certain places – such as supermarkets. Items like tobacco or alcohol cannot be purchased with the payment card. So good move but the payment card regime needs to be rolled out further and faster. Despite claims that the economy has come roaring back, Gross Domestic Product growth remains anemic. The number of people receiving Supplemental Nutrition Assistance Program (SNAP) benefits, or food stamps, alone has doubled since 2008, to 74.7 million; in troubled cities like Baltimore, more than one-third of the residents receive them. Called the "welfare cliff" by policy wonks, this growing trend is little more than people responding to incentives. For example, eligibility for food stamps ends when annual income exceeds 130 percent of the poverty line, or a little more than $15,000 a year, for an individual. When the minimum wage increases above this level, as it has recently in many cities and states, employees reduce their hours to keep their benefits. As a result, people forgo opportunity for safety. There is evidence that when the Wellington City Council introduced the living wage for its employees that's exactly what happened. They took the opportunity to work less rather than lose their Working For Families payments. So what has the council done? Extended the living wage to its contractors. The living wage will also be inflation-proofed. How is it paying for this? With a 4.5 percent average annual rate rise over the next three years. Well above inflation. That'll just push up rents and the costs of goods and services, and make the likelihood of filling all the empty retail space even more remote. Instead of accelerating the redistribution whirlpool the council must slow it down. If people need more money in their pockets tax them less, and cut your cloth. The contentious issue of voluntary euthanasia is one I have been considering for some time, and I want to explain here why I am preparing a private member’s (End of Life Choice) Bill to lodge for ballot in Parliament. The primary motivation for this Bill is compassion. Many of my constituents have urged me to proceed with a Bill, particularly in light of the withdrawal last year of a similar Bill sponsored by Iain Lees-Galloway, originally introduced by former MP Maryan Street. Two previous Bills on this issue have in the past failed to gain Parliamentary support, but the clear international trend since the 1990s is towards the legalisation of medically assisted end of life choice. Is a benefit cap on the cards in NZ? Items 2 and 3 could be implemented in NZ. The first is trickier. The benefit cap applies to the total amount of benefit going into one household. There is no benefit cap in NZ so it can't be reduced. It is interesting then, that our government - for the first time - has been exploring multi-benefit household statistics. If a benefit cap was on the cards here the first thing needed would be data. And there it was in the last Benefit System Performance Report. 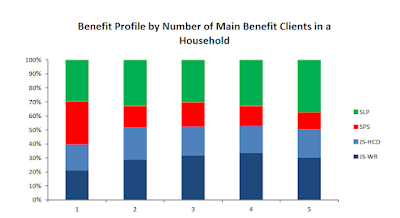 126,126 main benefit clients (or 40% of main benefit clients) live in a household with two or more people receiving main benefits. 30% of the 126,126 are partners on related benefits. While some correlation between employment prospects or health status of people in the same household is expected, the extent to which there are multi-beneficiary households seems high. 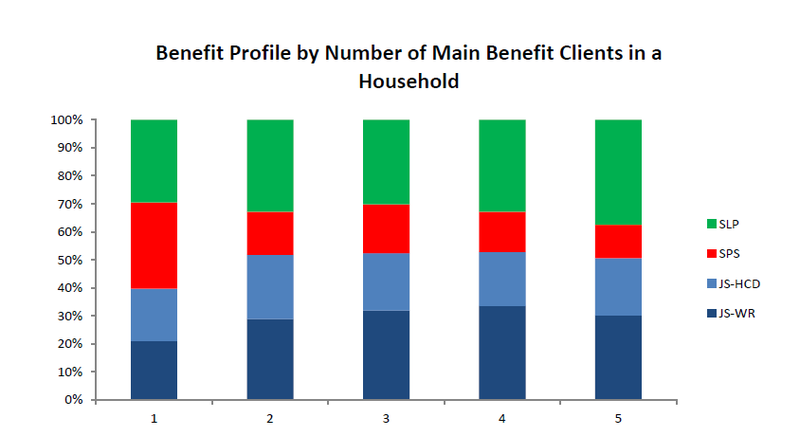  35,150 main benefit clients (or 11%) live in a household with three or more people receiving benefits. The government introduced a cap on the total amount of benefit that working-age households can get so that, broadly, households on out-of-work benefits will no longer get more in welfare payments than the average weekly wage for working households. That would not be a difficult policy for National to sell.